My guys loved monster books when they were younger, but they did not want to be scared. There are so many great picture books about monsters that don’t have a scare factor in them. That makes them perfect for Halloween or any time. What’s your favorite not-so-scary monster book to read with your little ones? Monsters Don’t Eat Broccoli | In this rollicking picture book written by Barbara Jean Hicks and illustrated by Sue Hendra, monsters insist they don’t like broccoli. They’d rather snack on tractors or a rocket ship or two, or tender trailer tidbits, or a wheely, steely stew. But boy do those trees they’re munching on look an awful lot like broccoli. Maybe vegetables aren’t so bad after all! Monsters Love School | Summer is over, and now it’s time for the biggest adventure of all . . . Monster School! Join these colorful monsters as they go to school for the first time. 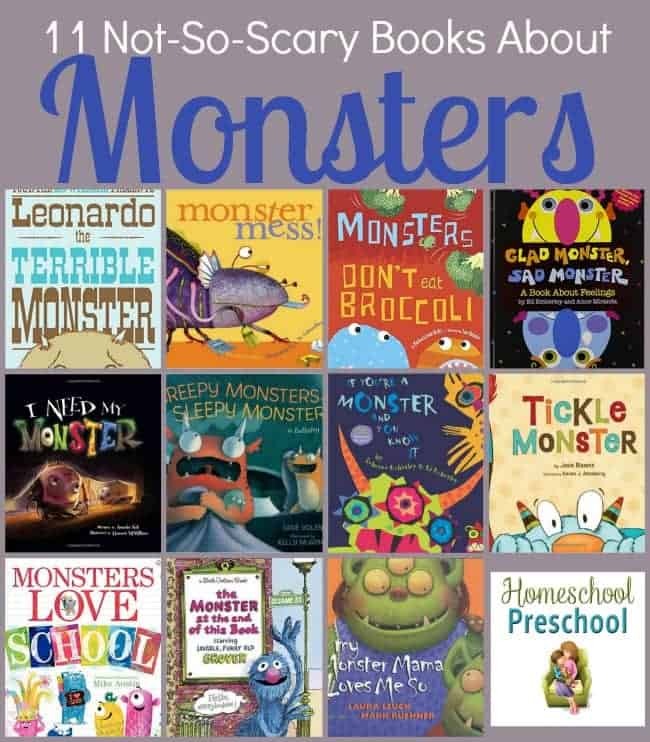 Reading and writing and learning your monster history has never been so much fun! Glad Monster, Sad Monster | Glad, sad, silly, mad – monsters have all kinds of different feelings! In this innovative die-cut book, featuring a snazzy foil cover, you’ll try on funny masks as you walk through the wide range of moods all little monsters (and kids!) experience. My Monster Mama Loves Me So | At once tender and funny, this monster bedtime story is guaranteed to generate giggles, tickles, and plenty of monster hugs. The Monster at the End of This Book | By all accounts, this book is a favorite among toddlers and adults alike. Generations will recall their first time reading along as lovable, furry old Grover begs the reader not to turn the page . . . for a monster is at the end of the book! But, of course, the monster is none other than Grover himself. Monster Mess! | Crash, crash! Stomp, stomp! A tired monster goes up the stairs. But zzzz, zzzz, a boy is sound asleep. And ick, ick, his room is not so neat — not neat enough for a monster to take a nap! So whishtt, whishtt, the monster starts to clean. Creepy Monsters, Sleepy Monsters | Creep, gurgle, crawl, tumble! Meet two young monsters who are far from scary – they’re too busy having fun. They go to school, play outside with their friends, and eat after-school snacks. But they also have a bedtime, whether or not they’re ready for it! Tickle Monster | A loveable monster has just flown in from Planet Tickle on a mission is to tickle any child who happens to be following along with the Tickle Monster book. Parents read aloud and do the tickling, while children laugh and squirm with delight. I Need My Monster | One night, when Ethan checks under his bed for his monster, Gabe, he finds a note from him instead: “Gone fishing. Back in a week.” Ethan knows that without Gabe’s familiar nightly scares he doesn’t stand a chance of getting to sleep, so Ethan interviews potential substitutes to see if they’ve got the right equipment for the job—pointy teeth, sharp claws, and a long tail—but none of them proves scary enough for Ethan. When Gabe returns sooner than expected from his fishing trip, Ethan is thrilled. It turns out that Gabe didn’t enjoy fishing because the fish scared too easily. Leonardo the Terrible Monster | Leonardo is truly a terrible monster-terrible at being a monster that is. No matter how hard he tries, he can’t seem to frighten anyone. Determined to succeed, Leonardo sets himself to training and research. Finally, he finds a nervous little boy, and scares the tuna salad out of him! But scaring people isn’t quite as satisfying as he thought it would be. Leonardo realizes that he might be a terrible, awful monster-but he could be a really good friend.